We have considerable experience of working in acute hospital environments delivering a broad range of projects from one-off art commissions to extensive public art programmes, from single participatory projects to the development of ongoing hospital arts programmes. We have successfully worked as part of multi-disciplinary teams to create award-winning, integrated public art projects for healthcare environments. We are used to working with project stakeholders at all levels within an organisation and understand the differing needs and cultures of NHS Trusts, services users and staff, construction companies, architects, artists and members of local communities. We take an integrated approach to art and design in order to create therapeutic internal and external environments that reflect a hospital’s cultural context and involve local communities. We seek to ensure that our projects are always underpinned by patient, staff and community consultation. We follow models of good practice and uphold artistic quality and design innovation. The facade of the Bristol Royal Infirmary has long been lamented as ugly, dirty and in a state of disrepair. When the Trust asked us for ideas on how to improve its appearance, we suggested running a design competition which resulted in a clean, fresh new frontage. Integrated artworks installed in the new Bereavement Suite, including the Mortuary, Patient Affairs and the Sanctuary space. Integrated artworks support the patient journey and create a sense of local ownership and pride. This project won the Building Better Healthcare Award for the Best Use of Visual Art in Healthcare 2009. 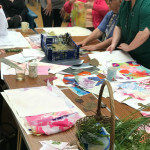 A festival of arts events and activities was the culmination of Southmead Hospital Bristol’s public art programme. The seamless integration of art, architecture and interior design creates supportive and uplifting environments for staff.